. Your ideas could have a direct impact on Google. As part of the recently-launched How Search Works website, we published our Search policy principles and a list of detailed Search content policies for the first time. Our goal was to show users how we think about controversial content in Search while still promoting fast access to the world's information. But we’re always looking to do better, and we’re curious to know what our users think. That’s why we’d love to see your ideas for improving our Search policies and processes. Should we alert users if we suspect that there's not much information on the web about their query? How should Google surface information that might affect a website's ranking? How should we deal with businesses that we believe may be hacked? Should we do something completely different to support our users? Anything related to how we serve content in search results or interact with users is fair game. Now’s your chance to make an impact and have fun doing it, so put on your thinking hats. You can submit entries using this form. We’ll review all of the submissions and contact some of the best contributors to discuss their ideas. P.S. If you need some ideas to get you started, check out this presentation from SMX West about Google’s search policies called "Walk a Mile in Google's Shoes: Dealing with Tough Calls in Search." If you use Google all the time and have ideas about how we could provide a better Search experience for our users, we want your help. Send us your best Search policy suggestions by filling out this form. Your ideas could have a direct impact on Google. indicates perhaps 10% of people’s daily information needs fit this category -- topics like stem cell research, happiness, and love, to name just a few. That's why over the next few days we’ll be rolling out a new feature to help you find relevant in-depth articles in the main Google Search results. 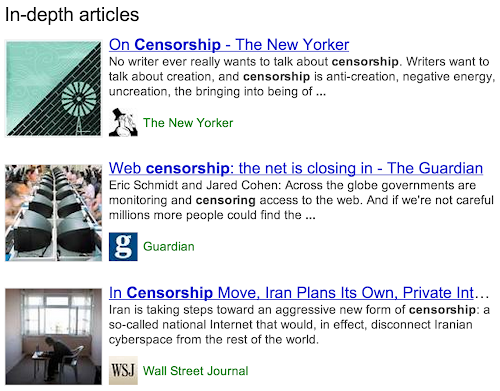 If you care about censorship, you'll find a thought-provoking article by Salman Rushdie in The New Yorker, a piece by our very own Eric Schmidt and Jared Cohen in the Guardian, and another great article about Iran. If you're in the mood for something lighter, search for [lego], you'll find great in-depth articles about many different facets of the topic from gender to engineering to art. For some more examples, check out new search results for population growth, capital punishment and e-waste. I'm happy to see people continue to invest in thoughtful in-depth content that will remain relevant for months or even years after publication. This is exactly what you'll find in the new feature. In addition to well-known publishers, you'll also find some great articles from lesser-known publications and blogs. If you're a publisher or webmaster, check out our help center article and post on the Webmaster Central blog to learn more. To understand a broad topic, sometimes you need more than a quick answer. Our research indicates perhaps 10% of people’s daily information needs fit this category -- topics like stem cell research, happiness, and love, to name just a few. That's why over the next few days we’ll be rolling out a new feature to help you find relevant in-depth articles in the main Google Search results.